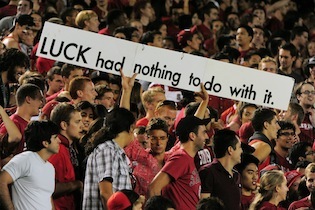 Schadenfreude of the Week: Matt Barkley will finish 0-4 in his career vs. Stanford. Your weekend had to be better. I won the week with 12/15 correct. Yes, but Bevo XIV (DW) still leads the league with 31 total points. Dude is picking 69% against the spread after 45 games. Amazing sprint out of the gate. As a whole, we picked 45% ATS this week. We are picking 49% ATS for the year.